George Westinghouse was a uniquely successful inventor and industrialist. He was chiefly responsible for the spread of alternating current (AC) electricity in the United States, the form of electric current still in use today. In addition, he made huge contributions to the railroad industry, launched the first commercial radio station, KDKA, in Pittsburgh, Pennsylvania, and introduced many new appliances into the home. Westinghouse was born in Central Bridge, New York, in 1846, the eighth of ten children. His father, also named George, manufactured farm machinery. As a young boy George would try out his ideas in his father’s shop. After serving in the Union army during the American Civil War (1861-1865), Westinghouse began his lifelong career of invention. He received his first patent at the age of 19. Some of the things he received patents for were rotary steam engines, air brakes, and natural gas pipes. He earned both fame and fortune as the inventor of a device that could replace derailed freight cars on railroad tracks. While working on air brake applications, Westinghouse came to see the importance of the standardization of equipment and tools, a principle he applied to all his business interests thereafter. In 1885 Westinghouse imported AC equipment from Europe and set up an AC electrical system in Pittsburgh. The following year the Westinghouse Electric Company developed constant-voltage AC generators. When Westinghouse purchased Nikola Tesla’s patents for an AC motor and hired Tesla to put the AC motor into use in the Westinghouse power system, the success of both the man and the company was assured. Westinghouse eventually won the battle with direct current (DC) electricity proponents such as Thomas Edison. 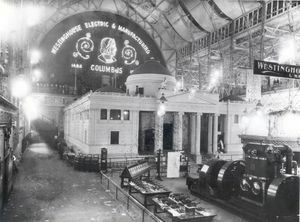 The victory was symbolized by the spectacular lighting Westinghouse provided for the 1893 Columbia Exposition in Chicago and even more by the rights he secured to develop Niagara Falls through AC generators. Based in Pittsburgh, Westinghouse Electric flourished. 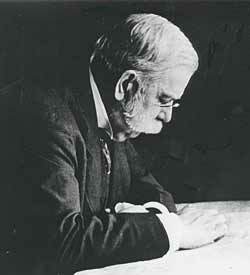 Westinghouse lost financial control of his company shortly before his death in 1914. However, the company that bore his name branched out into electrical production and became an icon of homegrown American business success. This page was last edited on 26 January 2016, at 16:49.